How many college athletes do you know who were also Olympians? Or better yet – who also took first place in a district of the Congressional Art Competition? Meet Savanah Leaf, Miami volleyball’s leading scorer and starting outside hitter who is as dynamic as her resume suggests. The senior and California-native has garnered two shelves-worth of accolades during her tenure, including 2013 All-ACC First Team, 2013 All-ACC Academic team and even a few ACC Player of the Week awards that were recently sprinkled onto the mix. But when she’s not racking up 16 kills per game, Leaf is using a different ball to express herself – one you would find on a ballpoint pen. Her family is her biggest supporter, she says, though they’re 3,000 miles west. When asked for whom she plays, Leaf cited her two immediate family members: her mother, Alison, and her younger sister, Corinna. After living in England for eight years, Leaf and her mother moved to Northern California, where Leaf would lead her Marin Academy volleyball squad to a Bay Counties League West title in her senior year. During a time when California-native Lisa Leslie was still collecting her trio of WNBA MVP hardware, Leaf originally had her eye on the other hardwood sport, basketball. But after a successful sophomore season in which she was named PrepVolleyball.com’s 2008 “Best High School Sophomores in the Country,” she fully dedicated herself to spikes and kills. 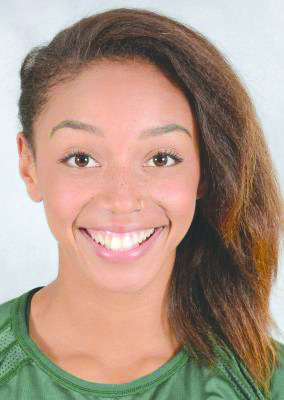 Now, during her third and final season at UM (she transferred from San Jose State), Leaf has already established herself as one of the volleyball program’s all-time leaders. In fact, against Georgia Tech, she became the eighth player in school history to register 1,000 career kills – more men have walked on the moon. And as her ACC-best 4.7 kills-per-set this season has led the Canes to a healthy 14-6 record, Leaf is taking her final campaign one match at a time. But as those familiar match-ups start to get crossed off her calendar for the final time, Leaf is already looking towards the future – which of course promises more than just athletics. She loves to tell stories. She loves to play volleyball. And as her last season commences, we’ll see how she composes the final chapter of her tale as a Miami Hurricane.